Before proceeding further, it could prove helpful to glance over my blog entry from a few days back, “The Science Guy, c. 1877,” concerning Professor Joseph Taplin Lovewell of Topeka, a scientist, teacher, and great popularizer of science and technology. In July of 1902 the Topeka State Journal covered a meeting between the professor and his cousin Thomas, the gentleman whose visage graces the banner of this website. To understand the way the two men actually were related, it can also be useful to present the full item from the Topeka paper, as reprinted in the Scandia Journal, and then pick apart the details the reporter got wrong. “Thomas Lovewell, the founder of the town of Lovewell, Jewell County, Kansas, visited Topeka Wednesday with J. T. Lovewell of this city. They are distantly related. Their grandfathers were brothers. 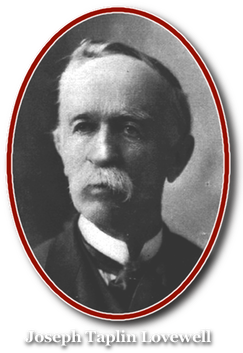 Thomas Lovewell came to Kansas in 1856, and is now 76 years of age. He has recently been out in Wyoming prospecting for minerals and in spite of his age, is hale and hearty and able to out travel most men who are 50 years younger. The war record of the Lovewell family is somewhat remarkable. The great great grandfather of Thomas Lovewell was a colonial soldier in King Phillips’ war, and the latter served as an ensign under Oliver Cromwell. Thomas Lovewell’s great grandfather was John Lovewell, who held a captain’s commission in the	colonial army, and was killed while fighting Indians at what is called Lovewell’s pond, in Maine. The grandfather of Thomas Lovewell was Colonel Nehemiah Lovewell, who served through the Revolutionary war. Mr. Lovewell’s father served in the war of 1812 and Mr. Lovewell himself was a soldier in the Union army in 1861. To complete the line, Mr. Lovewell’s son has recently returned from the Philippines, where he served during the campaign. First, their grandfathers were not brothers, a family tie which would have made them second cousins. Their great-grandfathers were brothers John and Nehemiah Lovewell, the sons of their great-great-grandparents, Captain John Lovewell and his Wife Hannah. Measured through their great-grandfathers, Thomas and Joseph Taplin Lovewell would have been third cousins. However, that is not quite the extent of their family relationship. But I’ll get back to that. As for the other errors in the newspaper clipping, Captain John Lovewell was actually both men’s great-great-grandfather. Colonel Nehemiah Lovewell was not Thomas’s grandfather, but his great-grandfather. Yes, there was an ancestor who fought in King Philip’s War and who may have been an ensign in Cromwell’s army, but he needed to be shoved backward a generation with the addition of one more “great.” With that out of the way, let’s come back to that tricky part. Take a deep breath. Captain John Lovewell’s eldest son John was born at Dunstable in 1718. Captain John's youngest son Nehemiah was born 9 January 1726, eight months after the Abenaki ambush that claimed his father's life. John was the great-grandfather of Joseph Taplin Lovewell. Nehemiah was Thomas’s great-grandfather. However, young John Lovewell also had a son named John, who married his Uncle Nehemiah's daughter Vodica Lovewell. Cousins John and Vodica Lovewell were the grandparents of Joseph Taplin Lovewell and Joseph’s older brother John. Vodica Lovewell was also the sister of Zaccheus Lovewell, who was Thomas Lovewell’s grandfather. There are all sorts of cousins, referred to by ordinal numbers, as well as an indication of how many generations removed they are from each other in the family tree. Special names are used to designate whether the ancestral pair of siblings belonged to different genders or the same one, making their descendants either cross-cousins or parallel cousins, the latter also known as ortho-cousins. The distinction may seem silly today, but it was once considered important. I first came across the term “ortho-cousin” in a Nero Wolfe mystery some years ago. Even then the term was obscure enough that when a suspect used it, Wolfe correctly deduced that the man had conducted an intensive study of family relationships, and was planning to marry his cousin. There are also double cousins, which result when two or more siblings from one family marry two or more siblings from another, and thus all have children who share the same two sets of grandparents. Colonel Nehemiah Lovewell’s family took this situation to extremes, five of his own young Lovewells pairing off with five young Taplins. The list of grooms included Thomas Lovewell's grandfather, Zaccheus Lovewell, who married Hepsibah Taplin. The Lovewell/Taplin grand family merger even left its mark on Professor Joseph Taplin Lovewell, providing him with a middle name which probably honored an aunt or an uncle. The marriage of first cousins is considered risky in some quarters, forbidden in about half of American states, most of them western rural states, perhaps part of an effort to cut down on theose terrible jokes. So what do you get when cousins marry? Judging from Prof. J. T. Lovewell and his brother John, apparently, you get Yale graduates.